Like a forgotten dinosaur, the massive and primitive bird called the Southern Cassowary (Casuarius casuarius) stalks its hidden paths through the rainforest. For millions of years this creature has been master of its domain, changing the very face of the rainforest that it calls home. Now, the cassowary is endangered by humans and feral animals. Is the world's third largest bird, after the ostrich and the emu, and is in the same family. Lives in tropical forests in New Guinea and coastal North Eastern Australia. Is easily identified by its brightly coloured head and neck, and by the "horn" on its head. Females are dominant, and are larger and heavier than the males. It is the father cassowary alone that raises the chicks. Can reach two metres in height and weigh up to 85 kilograms. A bird in the wild may live for sixty years. Is extremely solitary and territorial, but birds will form into groups when food is scarce. Is a Fructivore, a fruit eater. It may eat just about anything when very hungry, however. Is an endangered species, there are probably less than 2000 left in Australia and they are declining. Population is decreasing, but cassowaries increasingly come into contact with humans as we invade their natural habitat. Is threatened by feral pigs, feral and pet dogs, and humans. Is far less dangerous than it is portrayed to be, but can definitely kill a man with its sharp kicking claws. Is most likely to die as the result of a road accident. Is almost solely responsible forseed dispersal and even germination of an estimated 70-100 species of plant. 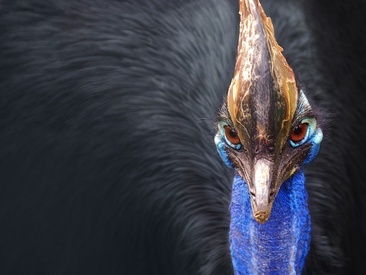 If the Cassowary became extinct, it would also destroy much of the rainforest ecology. 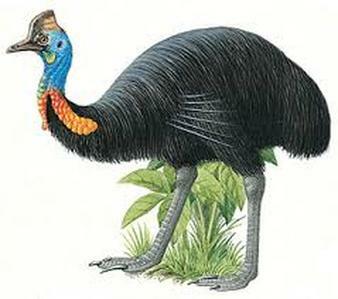 The Cassowary is a type very primitive bird, called a Ratite. It shares this family with the two other largest birds alive today, the emus and ostriches, as well as the tiny kiwi. There are four species of cassowary, three of which live in New Guinea. 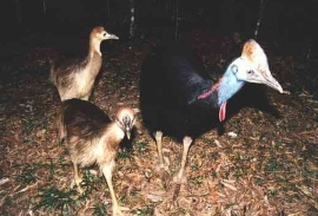 Australia shares with New Guinea the Single Wattled Cassowary (Casuarius casuarius), and also has the Southern or Double Wattled Cassowary (Casuarius casuarius Johnsonii). The female is dominant, and therefore larger, up to twice the body mass, her wattle is brighter, and she lacks the stubby tail of males that are smaller. Cassowary feathers are not smooth and flat, since they do not fly. Each vein on the feather hangs loose, creating a "hairy" coat that is perfect for pushing through the thorn riddled rainforest undergrowth. Unusual for a bird, the digestive tract has no gizzard so it can only digest the soft flesh of fruit, leaving the seeds unscathed. This provides a natural method of farming, the seeds of the Cassowary's favourite fruit trees get deposited in their own fertilizer along the bird's walking tracks, and about a decade later, there is a greater source of fruit along the bird's track. Over one hundred types of plant depend on Cassowaries to spread their seed, and many have even evolved to only start growing after passing through a Cassowary's gut. Cassowary eggs are laid around the month of June, in a "nest" made by scratching the ground and lining the shallow depression with grasses, leaves and ferns. Usually three to five eggs are laid. The eggs weigh around 500 grams and are pale green. Soon after laying, the female leaves, free to mate again. He turns and moves the eggs constantly in this time, to ensure that all the eggs are incubated evenly. The chicks' stripes start to fade when they are around five months of age. The male looks after the chicks for about twelve months by then they become solitary, and find their own territories. It may take another year before the birds begin to grow their casque, and another year after that until their brown feathers become the glossy black of the adult Cassowary.